The sample was knit in size S with 1” / 2.5 cm positive ease. 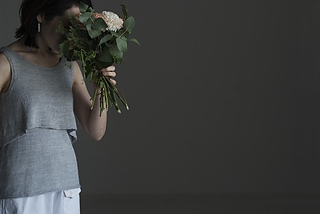 Tank top is worked in the round from the top down. Shaping shoulders with German short rows, base top is worked first, flat until the underarms then joined in the round with increases at sides from bust to hem. 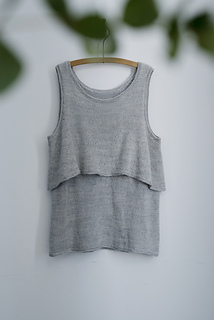 Overlay top is worked second, identical to the base top until the underarms, then joined in the round with increases at 6 points around the body, creating a shorter, wider top. Back of overlay is lowered with short rows. 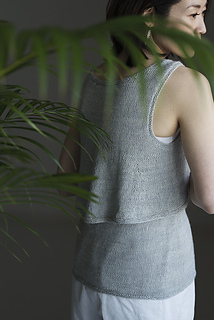 Overlay and base tops are joined by picking up and knitting neck-band and armhole edgings through both tops. このタンクトップは襟ぐりから裾に向かって編む. まずベースのトップス を編み, 次に上に重ねるトップスを編む. 二つは同様に編むが, 重ねるトッ プスの方がベースより丈が短く, 幅広く, さらに後ろ身頃が前身頃よりも長 くなっている. 最後のエッジ部分で, 両方のトップスを襟ぐりと袖ぐりで目 を拾いながら合体させる.